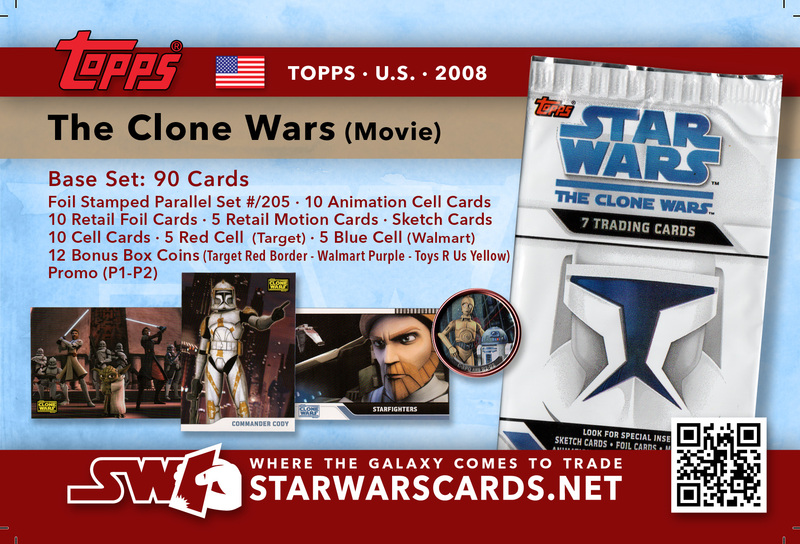 While 2008 started the year with a Star Wars card set by a company that was not Topps, and a card set that was not entirely Star Wars (The Family Guy), the Summer of Star Wars is being kicked off with a fun Topps card set that is all Star Wars. Continuing their tradition of creating a set with separate chase cards for the Hobby and Retail market, Topps has created a friendly 90 card base set that covers the plot of the animated film with chase cards that capture the dynamics of the animation. Movie Cell cards highlight the strong animation in a way that uses card technology nicely. These chase cards are fully plastic, and use nearly the full card to display a scene from the film. Illuminated from behind, they are a bright image and a great chase card. For the Hobby set, collectors can also find foil parallel cards. Unfortunately, these are serially numbered, with only 205 of each card available. 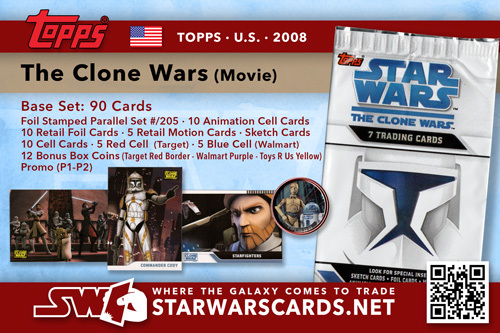 While this created the potential for 205 collectors to build full parallel sets of Clone Wars in foil format (only slightly shinnier than the standard card), these cards are not special enough to be an exciting find when pulled from the pack, and many collectors may opt to not collect these. The other Hobby chase card is the now ever present sketch card. While 19 of the film's animators contributed to the sketch cards in limited numbers, the majority of the cards are drawn by artists not affiliated with the film. With a fully animated film, this leaves artists immitating a style that isn't their own in some cases. The Retail card set has more chase card types than the Hobby set. In addition to the great Cell cards, Retail packs may contain Motion Cards or Foil Cards. At Toys R Us, Walmart and Target, shoppers can also find Bonus Boxes of the cards that come with collectible coins. With 2 coins per box, it may take some effort to collect all 36 available coins. Still, opening packs of Retail cards may have more 'fun' value since there are more types of chase cards to hunt for, and the Motion cards are a fun card type. Foil cards have simply become too common in many card sets as base cards to remain very interesting as chase cards. Card backs for this card set may disappoint many collectors. Although they contain some additional imagery, card backs essentially spell out the plot of the film. Additional information, interviews with animators or directors, and interesting details about the film won't be found here. Card backs limit themselves to briefly outlining the plot at that point in the story and nothing more. With only 90 cards, the card sets sketches an outline of the film, hitting major plot points, but failing to capture the drama of the fight sequences, and some of the more subtle points in the film may be over summarized here. On the whole, the card set is fun, with reasonable image selection. With an often dense screen and hyperactive style, the film is difficult to capture in card format, and Topps has made some good choices for capturing the essence of the major plot points. Special thanks to Kristie Rock for help with the checklist for this set. 38 The Shield is Down! 65 "Why You Tin-Plated Traitor!" 76 Jailed...But Not for Long! 80 No Rest for Ahsoka!